View cart “Bach, Johann Sebastian: Sämtliche Klavierwerke I – Toccaten” has been added to your cart. 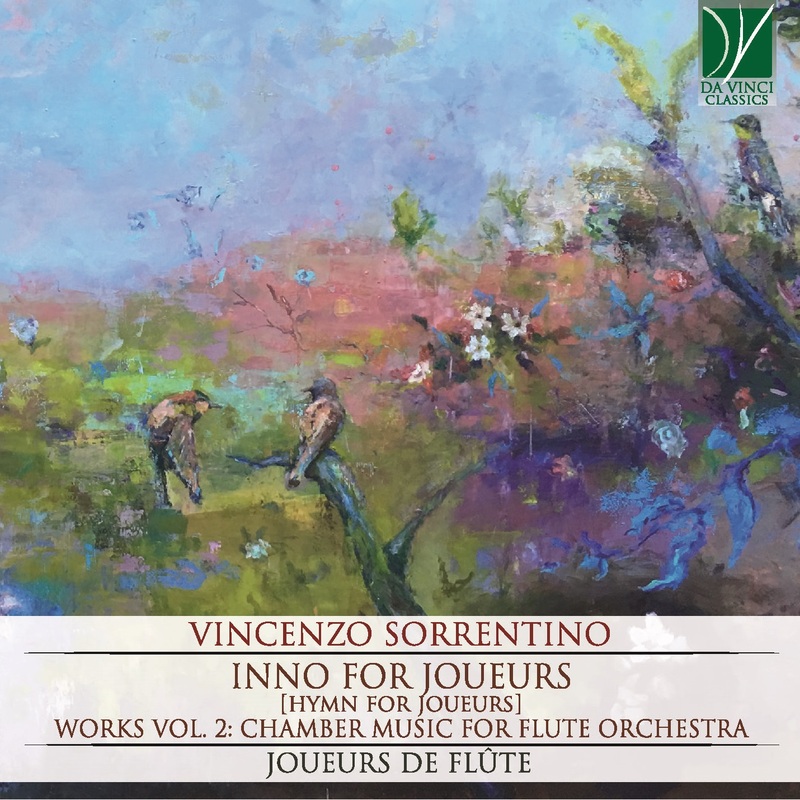 This anthology collects, among others, the pieces with which Vincenzo Sorrentino began his successful and prolific production of compositions for flute orchestra, commissioned by Joueurs de Flute, an ensemble led by Mariangela Biscia. Sorrentino met this group of young and gifted flutists in 2005; until 2008, it remained the only recipient, and, with Inno for Joueurs (2011), also the dedicatee, of the pieces in this CD, under the artistic supervision of Biscia herself. A warm and pleasant relationship blossomed on the occasion of the premiere of Flu-ten (2004) at the VIII Festival Italiano del Flauto (Italian Festival of the Flute), at the Auditorium Parco della Musica in Rome at the end of 2005. Soon after, the composer acquired the role of a reference figure for the Joueurs; in turn, the ensemble deserves the full credit for having presented his music at the prestigious NFA Convention in the United States of America. Not only are almost all of Sorrentino’s works for flute orchestra written exclusively for this ensemble; he also creates arrangements of works like La Ciarda by Vittorio Monti (2011), La Grande Polonaise by Theobald Boehm (2013), Le Merle Blanc by Eugène Damaré (2013), Soul Bossa Nova by Quincy Jones (2011) and medleys like Carosoniana (2011), Mission Medley (2012), Christmas Medley (2011) and Italian Medley (2011), all bearing the distinctive mark of his unmistakable style. These works, in fact, were composed with the aim of providing variety and novelty to listening experience of the audience, meeting their expectations on the occasion of the Joueurs’ concerts of national and international importance. On the other hand, they are also a sincere and affectionate tribute to musicians such as Ennio Morricone, to whom Sorrentino feels very close, or Pat Metheny. In A la manière de Pat, Sorrentino enjoys the possibility of translating and reworking the style of Metheny, an American guitarist and composer, through the use of classical formulas, with dense orchestration, often combined with classic counterpoint. In Sorrentino’s original compositions, from a stylistic point of view, one can always recognize the distinctive play with connections that requires agility and skill by all members of the orchestra. It is in fact from the synergy of the group that the individual parts gain personality and meaning; their interplay gives harmony and organicity to Sorrentino’s musical style. The "Joueurs de Flûte" Orchestra is one of the most universally acknowledged and well recognized flute groups in Italy. Founded in 1997 by Mariangela Biscia, "Joueurs de Flûte" gradually went from being a group of Mariangela's students, to a well-known group for their artistic prowess, both in Italy and abroad. The group is now made up of successful soloists, winners of first prizes in both National and International competitions, who regularly perform in excellent orchestras (Regio Theatre of Turin, Rai Symphonic Orchestra, Philharmonic '900, Tuscany Regional Orchestra, Lyric Theatre of Cagliari, Philharmonic Orchestra of Parma, and others). Their extensive concert activity has led the "Joueurs de Flûte" to be involved in renowned musical associations and to collaborate with several well-known soloists, such as R. Guiot, M. Marasco, C. Lefebvre, A. Adorjan. A very special collaboration and friendship started in 2011 with Andrea Manco, who performed with the “Joueurs de Flûte” Orchestra in several concerts and collaborated, with the well-known piccolo soloist Nicola Mazzanti, to the recordings presented here. The Orchestra participated as special guest performers at musical events dedicated to the flute, such as "Flautissimo", "Falaut Festival – International Festival of Flute", "Festival S.Gazzelloni", "British Flute Society Convention 2010". In the summer of 2011, they were invited to perform at the "National Flute Society Convention" held in Charlotte (NC, USA). Up to this point, the group has recorded three CDs sponsored and published by the musical journal FALAUT in 2005, 2009 and 2012. The group's objectives range from performing concerts to furnishing valuable resources for cultural associations and schools, including musical learning projects which have been carried out with the precious cooperation of the well-known English flutist Trevor Wye. The orchestra uses every instrument in the flute family: Piccolos, C Flutes and E Flat Soprano Flute, Alto Flutes, Bass Flutes and Contrabass Flute. Thanks to a large range of styles and timbres, the “Joueurs de Flûte” Orchestra has a continually growing repertoire. The group's creative originality stimulates some composers, including Vincenzo Sorrentino, to write new music especially for them. Vincenzo Sorrentino was born on 21 September 1973 in Nola. His musical education, enriched with humanities unfortunately unfinished, took place at the Music Conservatory “Domenico Cimarosa” of Avellino where , in 1996, he graduated in Piano and in 2002 in Composition. In 2007 he completed his Diploma in Composition with a Master Degree and in 2011 with a Diploma in Electronic Music. The detailed study of Composition, considered as more challenging and congenial to his sensitivity, had a special place in his artistic career. Thanks to assiduous readings, researching, critical listening and experimental courses, where tradition met new technologies and together longed for innovative elements, Sorrentino created an artistic production certainly open to overseas music echoes. The success obtained as composer through his participation in national and international competitions did not get him that notoriety achieved, instead, by networking his pieces and as a result of the rewarding and fruitful collaboration with musicians who let focus his production, essentially chamber music, on three crucial instruments: harp, guitar and flute. Sorrentino devoted most of his artistic production to the flute to which, since 2012, the Music National Convention of the United States of America (NFA Convention) reserves a special place in the annual program.